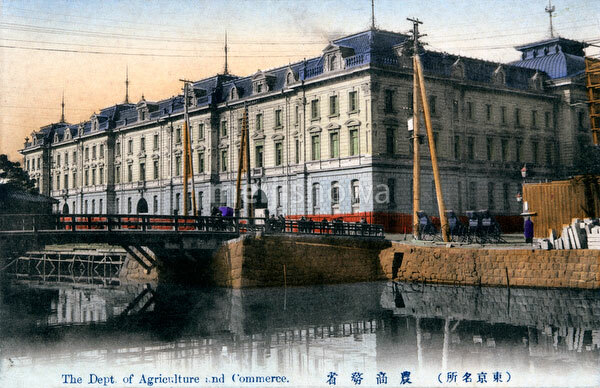 Ministry of Agriculture and Commerce (農商務省, Noshomusho) in Kobikichou, Kyobashi-ku (京橋区木挽町, currently Ginza, Chuo-ku), Tokyo. Designed by Takamasa Niinomi (新家孝正, 1857-1920), the building was completed in 1891 (Meiji 24). The bridge in front is the Unemebashi Bridge (采女橋), crossing the Tsukijigawa River (築地川). This wooden bridge was replaced with a concrete bridge in 1930 (Showa 5). In the 1960s, the river was filled up and it is now a busy highway.